In their third album together, their second as co-leaders, the spaciousness and delicacy of Karolina Strassmayer’s alto saxophone meld with the understated power of her husband Drori Mondlak’s drumming. The results are creative tension and whirling currents of surprise beneath the often-placid surface of music made by the spare combination of saxophone, drums, guitar and bass. Strassmayer is Austrian. Mondlak is an American of Polish parentage, born in Mexico City. In Strassmayer’s soloing, without quoting or making direct reference to John Coltrane, she nonetheless makes clear that the example of his boldness and lyricism helped to shape her concept. Her Coltrane tinge is apparent throughout, dramatically so in harmonic intervals and the shape of her phrasing in “Call of the Forefathers.” Nowhere in the album does Strassmayer’s own personality shine more radiantly than in her unaccompanied cadenza near the end of “Seven Minutes in Heaven;” a full minute of melodic invention and subtle dynamics. The precision, speed and reserved strength of Mondlak’s drumming are reminiscent of Joe Morello in his early years with Dave Brubeck. Although his uses of brushes and cymbals to color the music are major strengths in this quartet, he leaves no doubt that he is a full-service sticks drummer. In “Last One Standing” his technique is apparent in the tempo changes, breaks, and interplay with the veteran German bassist Ingmar Heller. With Heller, Mondlak’s longtime American guitar colleague Cary DeNigris provides not only harmonic support but also imaginative soloing that ranges from delicate single-line improvisations to the energy and slightly acerbic distortions of his tone on “Last One Standing.” This international quartet’s blend of consistent quality and adventurousness gives it staying power. It is one of the most interesting small groups at work today. Except for the universality of the music, there is nothing international about the collaboration among trumpeter Anders Bergcrantz, his wife composer Ann-Lena Laurin, and the Norlands Opera Symphony Orchestra. They are all thoroughly Swedish. Laurin, one of Sweden’s brightest composers, is trained in the classics, experienced in jazz and not limited to classical forms and traditions. She found inspiration for her five-movement work The Painter in the art and troubled life of Vincent Van Gogh, as the titles of the suite suggest: “Cypresses,” “Absinth Minded,” “Sunflower,” “Touches” and “Twilight.” The music incorporates a jazz rhythm section of pianist Robert Tjäderkvist, bassist Patrik Grundstrom and drummer Ulrik Ording. When jazz time-feeling is required, the orchestra under conductor Mats Rondin achieves that attribute so rare in symphony players, particularly in string sections. There are passages of grand symphonic sweep, as well as ensembles that Laurin endows with textures found in jazz orchestration. A brief section of the introduction to “Twilight” may be a reference to the sound tapestries of Gil Evans. In this report from the 2012 Ystad Jazz Festival, I commented on “Bergcrantz’s spacious tone throughout, regardless of speed or range…” Perfectly placed and engineered in the audio landscape of this recording, he is impressive on all of those counts. The passion and technical control of his playing in the “Sunflowers” movement justify pianist Richie Bierach’s assessment that Bergcrantz “…is one of the top trumpet players in the world today.” He manages to squeeze out notes in “Touches” that incorporate humor without distracting from the sober intent of the movement. He personifies the tragic implications of “Twilight,” opening with breath-only notes and what sounds like the mouthpiece alone. Then, his performance blooms into a full-throated threnody. His horn is supported by Laurin’s orchestration heavy on percussion and layers of repetition akin spiritually, if not harmonically, to riffs in a mournful blues. In the days of the Third Stream movement, attempts to marry classical and jazz forms often had awkward results. 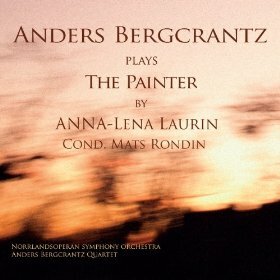 Without self-consciousness, Laurin’s and Bergrantz’s The Painter finds a credible and moving synthesis of the two genres.